My Christmas holiday is almost over already. Oh, the never ending grind of retail. One thing that never took a break through was my unenviable task of making over 20 posts in 13 days. It might seem like cake to more of the gifted bloggers out there. But again, retail. Also, I’ve got Overwatch and Destiny Christmas events to try and participate in. Have you no sympathy for me and my very real and serious problems. Anyway, enough waffle, let’s get on with it shall we. Today’s entry shows that sometimes, you don’t have to hang your show on a huge concept or gimmicky spectacle. Sometimes, if you just need to nail the basics and tell a simple story to an incredibly high standard. It’s really all you need to do to make a great show. The very best sports movies are the ones in which the sport is entirely tangential to the story being told. You could have them playing pogs or snooker, but as long as the character drama is there, it doesn’t matter what our underdog hero is doing to win our hearts. And boxing is the purest, most commonly used sport to tell these kinds of stories. And that’s what Megalo Box is; it’s pure, it’s simple and it does it all incredibly well. 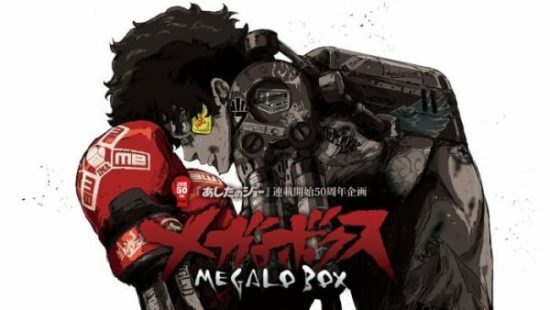 When I first spoke about Megalo Box back in July, I just wanted to put forward that you don’t need to be subversive or surprising to tell a good story. Sometimes, even the most predictable stories can be the most effective when told with as much skill and heart as something like this. Nothing about the events of this anime surprised me, and yet I was gripped. I knew Joe was going to win his way to the top in this cyborg boxing league, despite the fact that he boxed without the mechanical gear that made this world unique. Something that defied logic and should have surely ended with him severely injured, or dead. But this was a plucky underdog story and Joe would always defeat the odds, no matter how impossible. 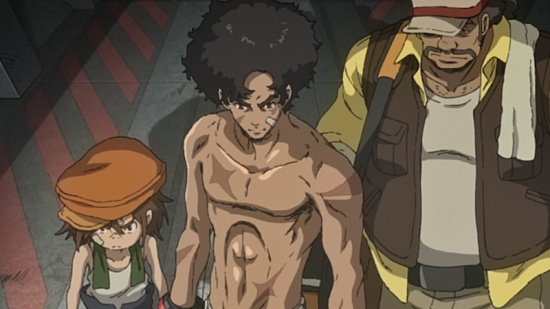 There was one thing that did surprise me about Megalo Box after watching it though. In the end, the boxing was hardly a factor in what was going on. Despite Joe being the main character, he is little more than a vector for the stories happening around him. Every other character in the show, including his opponents are so fleshed out, so humanised that you almost want them to win rather than Joe. Due to his superhuman grit and ability to take a tremendous beating, Joe inevitably wins, and somehow improves the lives of those he defeats. It might sound a little cheesy, and it probably is, but I was all the way behind it. Rather than list how every character introduced in the show went through a great, transformative journey. I’ll just talk about my favourite; Joe’s trainer, Nanbu. A washed up fight trainer who starts the series fixing fights for the mob, having lost his passion for life through the death of his prize pupil. 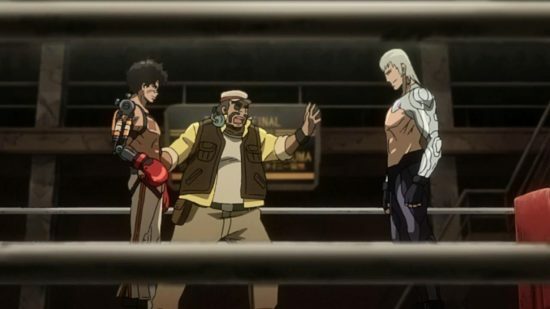 Through utter desperation and a need for money due to Joe refusing to throw fights, he and Joe enter the Megalo Box tournament under false pretences, hoping to con everyone to square away Nanbu’s debts to the Mob. But Joe’s passion to fight reignites Nanbu’s passion to train, and together the two really start to believe. The growth and final actions of Nanbu’s character is my favourite character arc in any anime I’ve seen all year. It’s a fantastic show, one that ends up showing surprisingly little boxing. And you hardly notice. I didn’t even get into how stunning the visuals are, how amazing the music and tone for the show are or how unique the setting is. It’s a stunning achievement and one I’d recommend everyone go out and see. Anime and non-anime fans alike. Especially now the Dub is out. 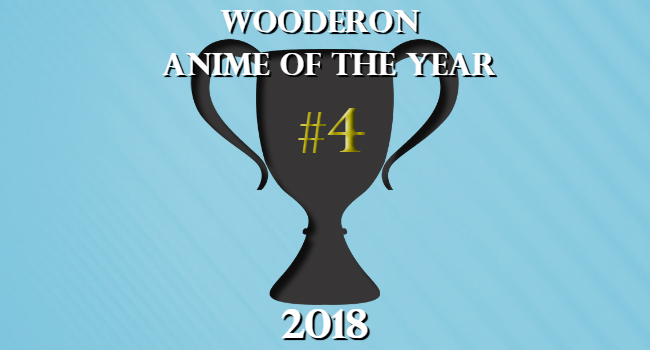 Posted on December 27, 2018 December 20, 2018 by WooderonPosted in 2018, Best of Year:Tagged anime of the year, boxing, katsuhhiko manabe, kensaku kojima, megalo box, real steel, robo rocky, sport anime. I have been listening to the soundtrack on and off since first watching it. I’ve even thought about going back and watching it again, which is something I rarely do.